Innovative spirit and product diversity are the hallmarks of Worcester’s industrial legacy. Worcester emerged as a center of manufacturing more than 150 years ago. From the start, local investors encouraged small-scale experimentation and innovation. As a result, Worcester served as an incubator for many industries. Even today, it remains unsurpassed among mid-sized cities in America in the variety of goods produced. The rural town of Worcester grew into a bustling industrial city where people of many cultures and backgrounds jostled for their place. Great fortunes were made, and the gap between rich and poor widened. Over time, the pace of change accelerated and the ways to make a living multiplied. The whole town is altered very much. In the early 1800s, inventive machine builders and far-sighted investors laid the foundations for Worcester’s industrial success. New transportation systems tied Worcester to a national marketplace, spurring economic development. It was an era remembered as a paradise for mechanics, a time when local men of wealth provided workspace for enterprising men, encouraging innovation and spawning diversity. Thousands of people streamed in from the countryside to take advantage of new opportunities. Factories and tenements sprouted up as if overnight. Along with the whirlwind transformation came political and social tensions. Most significantly, Irish immigrants came to build the Blackstone Canal and the railroads, and stayed to build a Catholic community in Protestant New England. Beginning in the nineteenth century, a series of changes in how things were made led to the rapid growth of manufacturing in America. Textile mills led the way. Workers made thread and cloth using new machines that were copied from English models and powered by New England’s rivers and streams. Worcester’s landscape included numerous textile mills, but limited water power did not attract the Boston investors who founded great textile cities like Lowell. Instead, among the many other industries that developed in Worcester, the city became a center for manufacturing dozens of different kinds of machines used to turn cotton and wool into cloth. Transportation improvements were critical to making Worcester an industrial city. Irish laborers completed the Providence-to-Worcester Blackstone Canal in 1828 and the Boston-to-Worcester railroad in 1835. 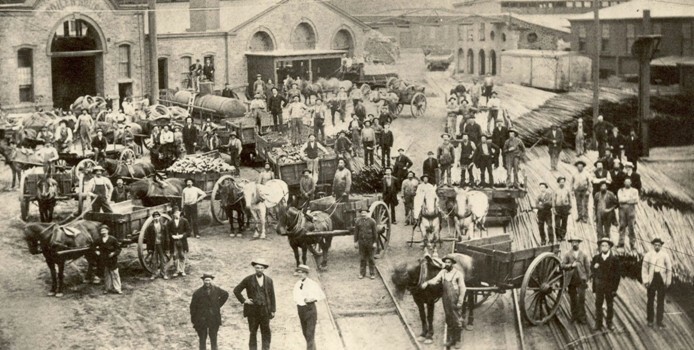 The new transport routes made it possible for local manufacturers to obtain raw materials and ship finished goods relatively cheaply and in large quantities. By the 1850s, the city had become a hub in the regional rail system, giving Worcester businessmen a cost advantage over outlying competitors. With these developments Worcester, formerly a farming community, became an industrial boom town. Ichabod Washburn (1798-1888) came from Millbury to Worcester in 1818 without money or family ties, and thirty years later he ranked among the city’s richest and most influential citizens. Washburn was best known of his generation of men-men with mechanical talent and ambition who were attracted to Worcester by the opportunity to prosper in the growing sector. He established a company for making wire in 1831 and over time developed key innovations in its manufacture. When he died in 1868, the company was the largest wire making firm in America. It was valued at one million dollars. Worcester reached its height as a manufacturing center in the early twentieth century. As industry boomed, business leaders promoted Worcester as the ideal industrial city, a city of prosperity. Immigrant workers continued to pour in, creating an ethnic mosaic. They came from new places, including Lithuania, Poland, Italy, Greece, Finland, Syria, and Armenia. Large-scale industrialists tried to foster loyalty, improve productivity, and maintain a measure of control over their diverse work forces by offering housing, recreation, and social services. Until the Great Depression slammed on the brakes, this was a bustling era when railroads, trolleys, and pedestrians clogged streets, smokestacks spewed, machines hummed, and products rolled out. Worcester survived New England’s industrial decline, and today the traditions of innovation and product diversity are very much alive. World War II recharged the city’s depression-ravaged industries. The sprawling South Works of the American Steel & Wire Company reflected America’s dominance of the world economy in the 1950s. But beginning in the 1960s, the city’s aging industrial base eroded, as firms closed or moved away in the face of global competition. Even so, some older firms adapted and still thrive. New inventions, innovations, and businesses keep Worcester’s manufacturing legacy alive, providing employment for thousands. It is not possible to present all of Worcester’s industrial history online. Many additional stories might well be told here, such as the role of small shops that served as suppliers, subcontractors, and consumers for big companies. And there are a number of large companies of national significance that we’ve hardly mentioned. We’d also like to know what it was like to work in Worcester factories, to explore the role of unions, and learn more about the interplay between politics and development over the years.